There has already been a review of Yashima Noodle in the Olympic Collections at Sawtelle (which is apparently now closed), but none of the other restaurants in the building. Now, it’s time to checkout Kiriko, which is located on the first floor, on Sawtelle. It’s a very small and narrow restaurant, so if you’re going to go when it’s busy, I’d suggest you make reservations. Most of the restaurant space is taken up by the long sushi bar. You can park on the street, or better yet, just park in the Olympic Collections parking lot and get validated. The tables are very small and just barely enough space for your food. In the extreme back of the restaurant, there’s what appears to be traditional sitting areas if you want to sit on the floor, but I’m not positive it’s not just for show. We were seated very close to the entrance and the music was a little too loud. This is caused by the speaker system setup being uneven, causing them to have to turn up the sound to make it loud enough for the entire restaurant. They need a more expensive system with multiple speakers spread out around the restaurant. Expensive restaurants usually have that down. 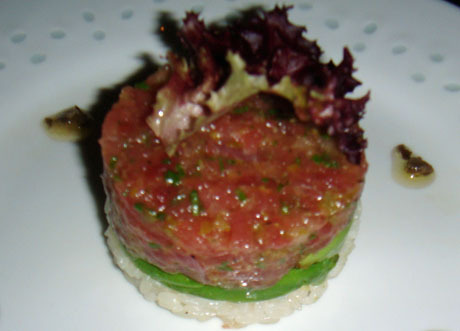 We started the mean with some Tuna Tartar, which was on a bed of avocado and rice, prepared in a European style, rather than Japanese. For me, it was a little too oily and bland, but some people may like it. 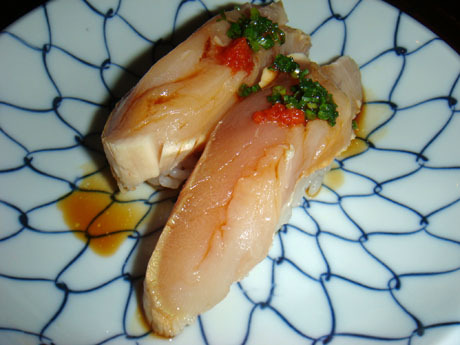 Next, I wanted to try out some Nigiri sushi, so I tried some Albacore. The ponzu was perfect, the Albacore was fresh and the nigiri was prepared well. No complaints here. The waiter highly recommended the Shrimp Tempura roll for some reason, so I tried it and found it to be very average at best. Nothing wrong with it, just not something that should come highly recommended. We also had their “Uni to Hotate no chawanmushi,” which is a Japanese style hot egg custard with sea urchin and scallop. The chawan-mushi is a very traditional Japanese dish and this was prepared perfectly. We also had ice cream for desert, which doesn’t warrant any review, in my opinion. 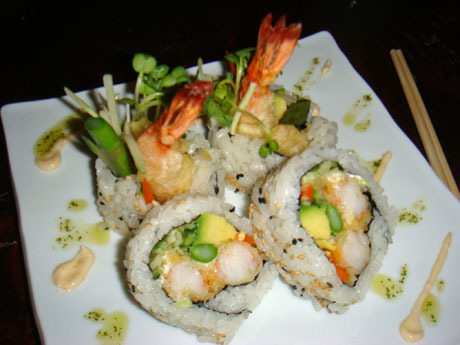 So, the sushi is above average, and I don’t think it’s worth the somewhat higher price. I’ve had better sushi for the same or even lower price. The service was subpar, especially since we were basically the only customers there. The waiter never checked to see if we needed more green tea, and I had to ask for more myself. All in all, if you’re in the area, you can check this place out but it’s not worth an extra trip from another area.